Astronomers have uncovered a supermassive black hole that has been propelled out of the center of a distant galaxy by what could be the awesome power of gravitational waves. 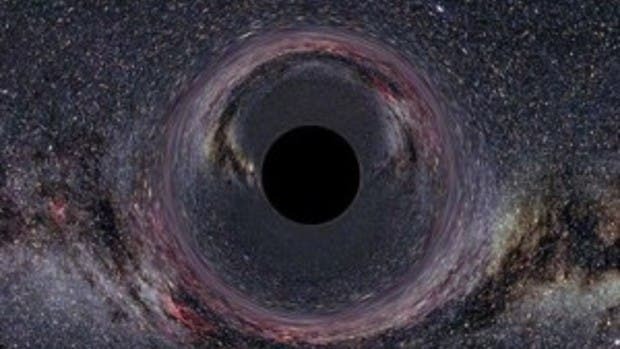 Though there have been several other suspected, similarly booted black holes elsewhere, none has been confirmed so far. Astronomers think this object, detected by NASA's Hubble Space Telescope, is a very strong case. Weighing more than 1 billion suns, the rogue black hole is the most massive black hole ever detected to have been kicked out of its central home. The illustration above shows how gravitational waves can propel a black hole from the center of a galaxy. The scenario begins in the first panel with the merger of two galaxies, each with a central black hole. In the second panel, the two black holes in the newly merged galaxy settle into the center and begin whirling around each other. This energetic action produces gravitational waves. As the two hefty objects continue to radiate away gravitational energy, they move closer to each other over time, as seen in the third panel. If the black holes do not have the same mass and rotation rate, they emit gravitational waves more strongly in one direction, as shown by the bright area at upper left. The black holes finally merge in the fourth panel, forming one giant black hole. The energy emitted by the merger propels the black hole away from the center in the opposite direction of the strongest gravitational waves. Hubble images taken in visible and near-infrared light provided the first clue that the galaxy was unusual. The images revealed a bright quasar, the energetic signature of a black hole, residing far from the galactic core. Black holes cannot be observed directly, but they are the energy source at the heart of quasars – intense, compact gushers of radiation that can outshine an entire galaxy. The quasar, named 3C 186, and its host galaxy reside 8 billion light-years away in a galaxy cluster. The team discovered the galaxy's peculiar features while conducting a Hubble survey of distant galaxies unleashing powerful blasts of radiation in the throes of galaxy mergers.